The Nintendo Switch is about to come out, and people are equal parts excited and wary. Can it live up to expectations? Is it worth the price? Fear not, for I’m here to answer all of your questions. 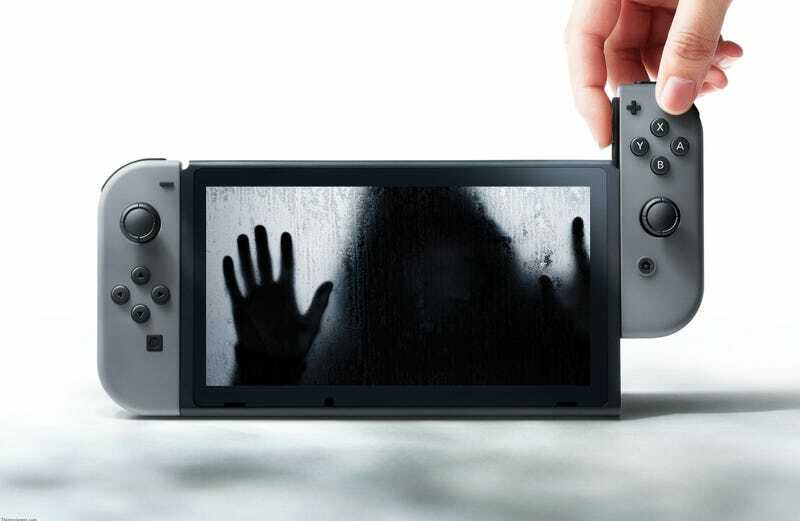 Last night I dreamed I had a Nintendo Switch. It was alright. First, the basics: the Nintendo Switch is about as wide across as your average tablet device, except for when you pull on it, and it stretches like a piece of taffy, then rolls up like curtains in Looney Tunes cartoons. It’s light and rests comfortably in your hands, but sometimes you can’t move it because your arms suddenly feel like noodles slithering through wet cement as you’re beset on all sides by specters who represent people you’ve left behind. The Joy-Cons are cool, too. The graphics are, as you’d expect, not quite on par with what a high-end console or PC can deliver. They are, however, pretty impressive for something you can bring with you on a plane that’s also a version of your dad’s house from right before your parents got divorced when you were ten, and your brain just accepts both those things to simultaneously be true. It’s kind of a pain that your pet cat won’t stop brushing against it, but your pet cat’s been dead for nine years, and you miss him a lot. You’re just glad to see him again. He’s warm. You try to say words to him, but no sound comes out. It never does. Now the bad news: as far as I can tell, there’s only one game, and it involves a person you’ve never met, but who you identify as several of your exes, leading you through a cave. In a neat twist, you’re playing the game on the Switch, but also you’re physically inside the game, viewing yourself simultaneously from first and third-person perspectives. It can be a little disorienting, but once you get the hang of it, it allows for some cool puzzle-solving opportunities. Problem is, you keep falling through the ground, and you feel the love that once illuminated your heart grow more and more distant each time. At one point, your amalgam of exes reaches to catch your hand, but you no longer recognize any of her faces. Your arms go weak again—they’re supposed to be strong and fast, the way you trained them to be, but never here—and you fall through the ground once again. Totally not Nintendo-quality, in other words! This game needs a day-one patch, stat. There is a tunnel. There is only a tunnel, for all else has fallen away. It gasps a ghastly wind, a chill that turns your blood to icicles. You try to turn away, try to leap out of your own skin and to somewhere—anywhere—else, but you can’t. The tunnel compels you, and you enter.